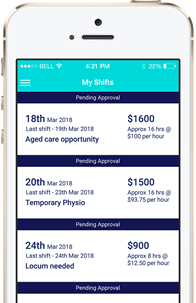 The Lokko app enables GP clinics, hospitals and healthcare facilities to fill locum and permanent roles faster and cheaper than traditional methods. Manage your inhouse and external team, all from your phone. Perfect for both high volume and one-off availability. If you need to fill temporary or even full time positions, simply add a shift and wait for a suitable doctor to apply. Lokko makes it easier to find work and travel at the same time. It can also be used to subsidise your part time or full time work, giving you the flexibility to pickup shifts when it suits. Build your ratings and reputation on the app to get more shifts, or increase your rate. You can also upload your credentials and store them all in the one place, making it a hassle free process for both you and the clinic. Why Lokko and not a typical job board? Where can Lokko be used? Lokko can be used anywhere, especially for those using it for just their inhouse team. Lokko is growing, but please get in touch if you would like us to extend our reach into your area. When you need to find someone outside of your own network, Lokko’s pricing is based on the length of the shift. • Your first 2 shifts are free to list! Pricing is in Australian Dollars and includes GST.